Subglacial bedrock frost heave and plucking. Linking the two processes. 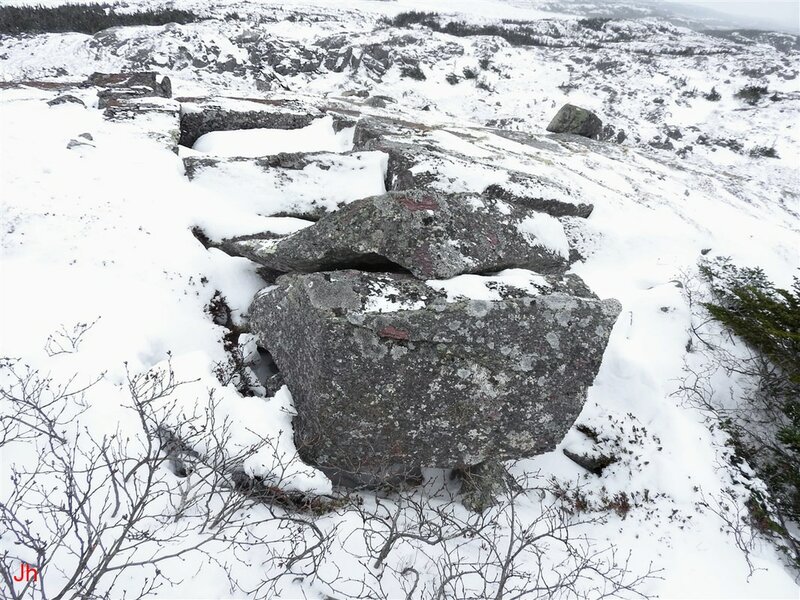 The above photo shows a frost-heave occurrence that combines both bedrock frost heave and hillside frost wedging (restricted plucking). It is important to link these two processes where such a link can be justified by observations, because making the link narrows the range of possible explanations for the origin of both occurrences. The above diagram shows four distinct processes. Process A is the usual description of plucking by a warm-based glacier, while process B is the most common description of bedrock frost heave occurring in an unglaciated periglacial environment. Processes C and D can lead to similar relict features as processes A and B respectively, but with significant differences in the modes of origin of these features. The analysis of disrupted bedrock feature IF05 is aimed at unifying the two processes, restricted plucking and subglacial bedrock frost heave, and demonstrating that these two phenomena are really the same process. If the two phenomena are unified, process A and process B become less likely explanations for the resultant relict features. 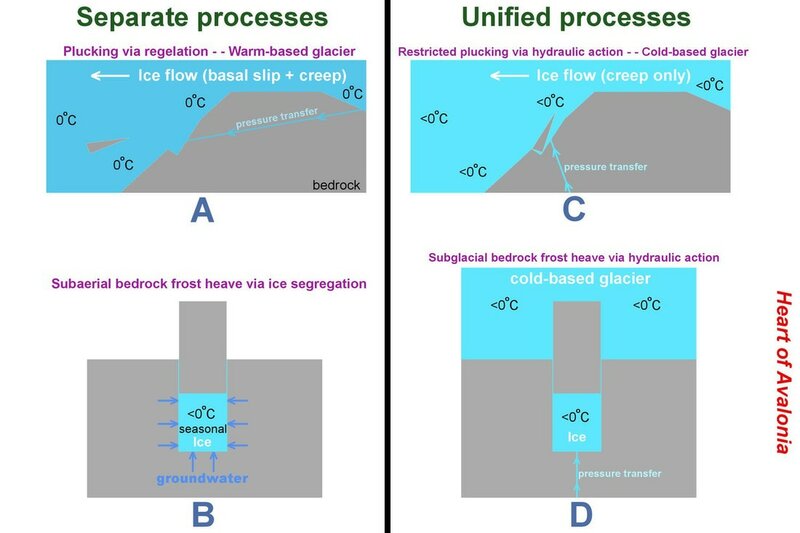 Processes A and B are mutually exclusive and cannot occur at the same place and at the same time, because A is a subglacial process while B is a subaerial process. Hence, only by coincidence would processes A and B occur in close association. Processes C and D occurring together would be an expected result wherever a horizontal surface undergoing subglacial bedrock frost heave grades over into a down-ice slope. 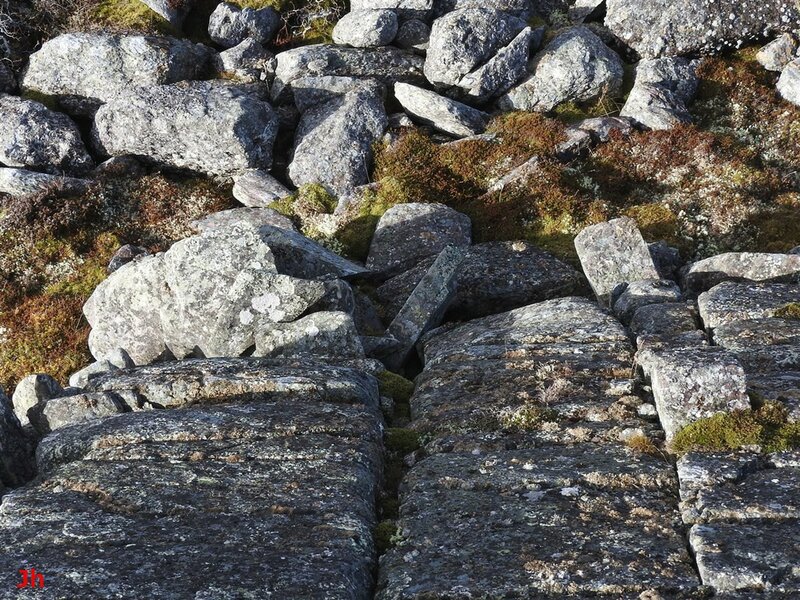 1) Restricted plucking (plucking where a sloping bedrock surface is disrupted, but no rock is shifted by more than a few meters) is an abundant phenomenon on the Isthmus of Avalon. It is also a large scale phenomenon with single occurrences often incorporating hundreds of square meters of disrupted bedrock. The frequency and scale of restricted plucking occurrences enhances the opportunities for analyzing the process. Bedrock frost heave, although common on the Isthmus, is somewhat less widespread, and typically smaller in scale. 2) Restricted plucking can be linked to glacial activity with a high degree of certainty. The best evidence of a direct link to glaciation is found in the asymmetry of occurrence of restricted plucking features. The features are almost exclusively found on slopes where ice flow is descending, that is, in places where glacial ice pressure is expected to be reduced. The exceptions are rare and small. 3) As demonstrated in the discussions presented as IF01, IF02, IF03 and IF04, evidence that bedrock frost heave has occurred subglacially can be obtained from varying types of observations. None of this evidence matches the quality of the asymmetry evidence supporting the conclusion that restricted plucking occurs subglacially. By showing that certain instances of bedrock frost heave represent the horizontal-surface equivalent of restricted plucking, strong evidence of subglacial origin is transferred to the bedrock frost heave occurrences. 4) In the analysis presented below, observations of IF05 are used to infer that bedrock frost heave on a horizontal surface is, in essence, the same process as hillside frost-wedging (restricted plucking). While this inference is demonstrated below only for the particular feature, IF05, many separate observations on the Isthmus of Avalon, including large-scale observations, imply that the link is widely applicable. 5) Analysis of IF05 supports the model that pressure propagating in a joint or fissure can push joint blocks upward into overlying glacial ice. If this model is correct, two questions require close examination: 1) Where did the pressure originate? 2) How does the pressure propagate in joints/fissures? These two questions appear increasingly central to understanding the origin of the relict bedrock frost heave seen over wide areas of the Isthmus of Avalon. Both of the features illustrated above occur in close proximity to IF05. The two pictures are included to exemplify instances of restricted plucking (the interchangeable term "frost-wedged hillside" also applies to these features). 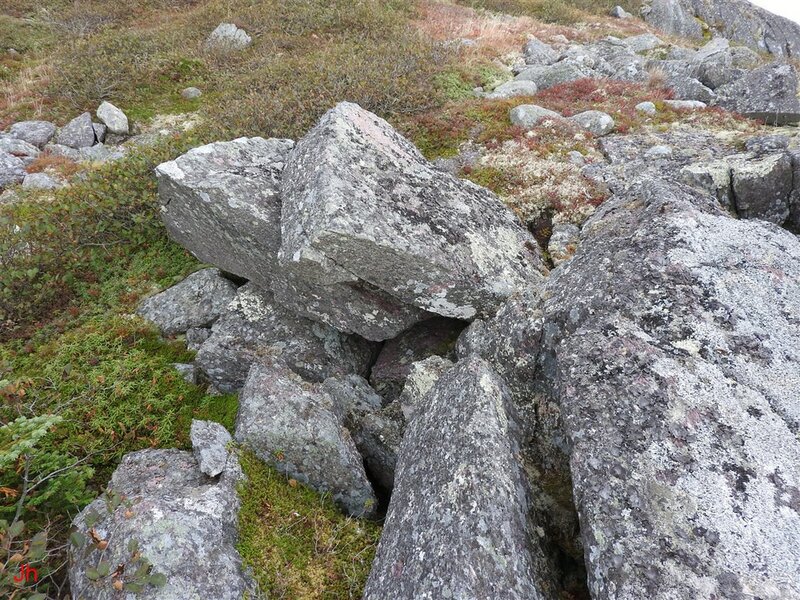 Both instances occur on slopes facing down-ice (lee slopes) and in both cases the bedrock has delaminated along planes of longitudinal cleavage. Note, however, the presence of cross joints, particularly evident in the second (right) photo. These cross joints were likely instrumental in transferring pressure to the subglacial rock face (see also IF01 and IF03). 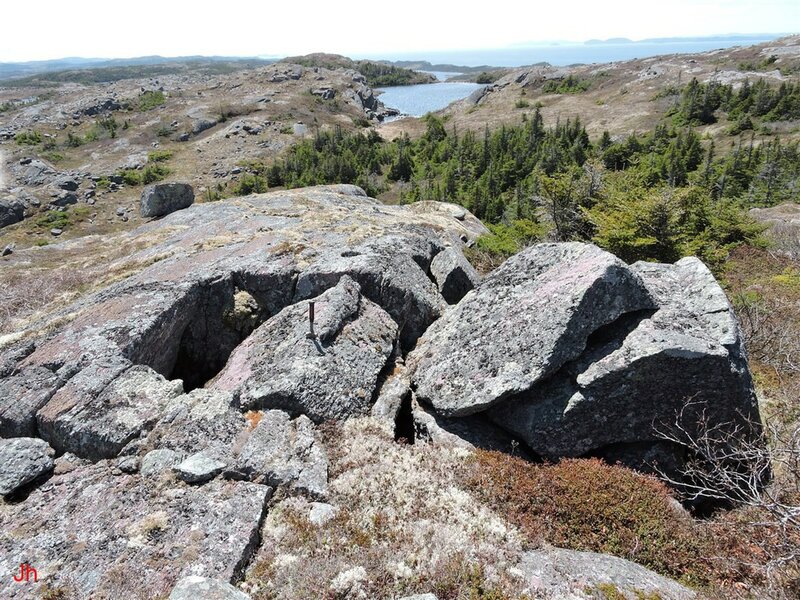 Although some rock may have been glacially transported a short distance out from the hill, it is an essential aspect of "restricted plucking" that the original bedrock landform remains substantially whole, although disrupted. 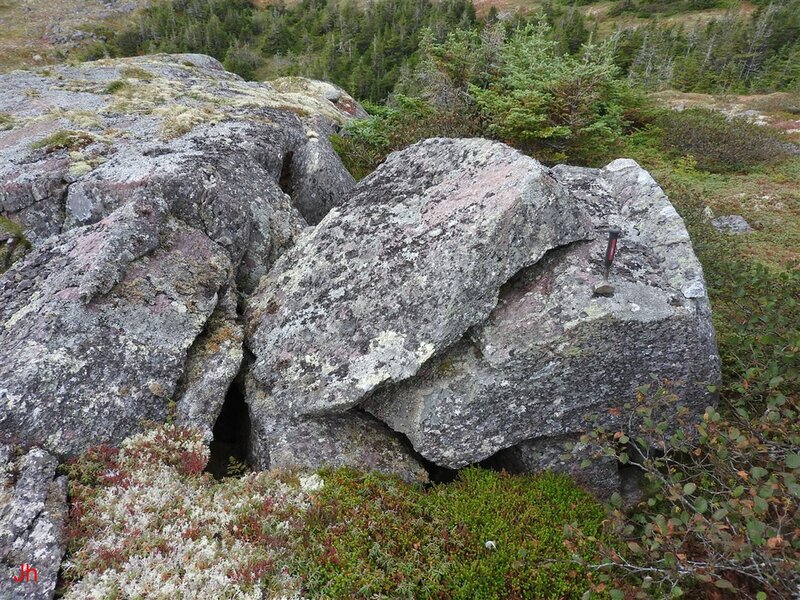 The lack of transport of rock away from a site of restricted plucking implies that cold-based glaciation was responsible for the bedrock disruption. IF05 is a compact feature comprised of three components. The first component is a row of frost-heaved joint blocks. The second component is an occurrence of restricted plucking. The third component is a set of joints/fissures that link the first two components. 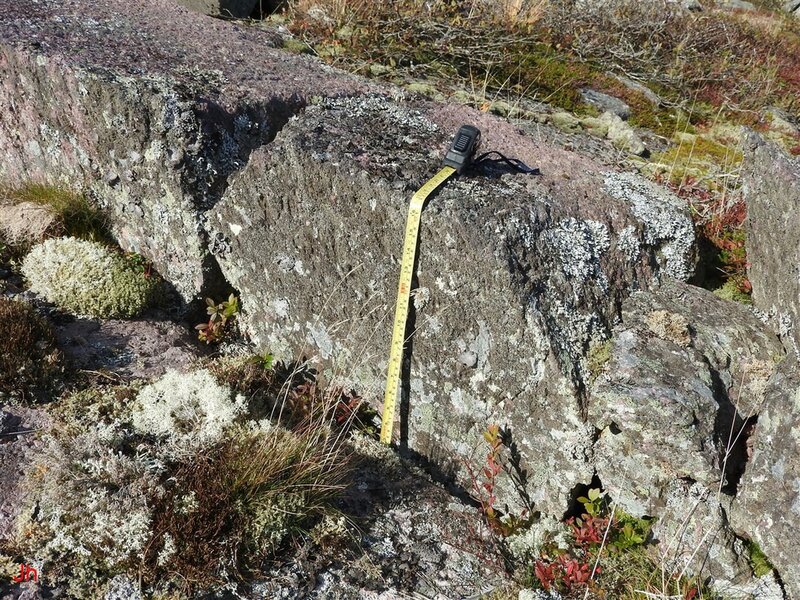 The above picture shows the scale of the disrupted-bedrock feature, IF05, which is 8.8 meters long end-to-end. The four photos above show the frost-heaved bedrock component of IF05, viewed from different angles. The measuring tape seen in the fourth (bottom,right) photo reads 43 cm at the point where it bends at the top of the joint block. 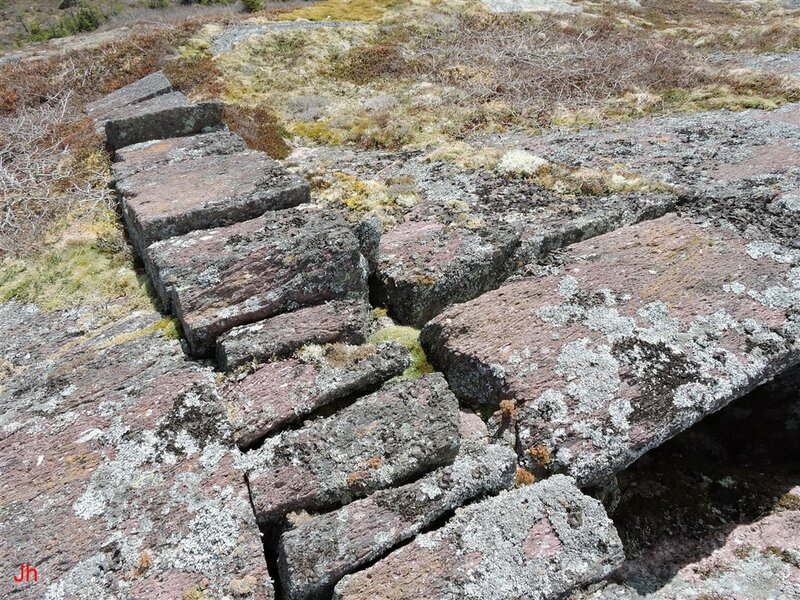 The row of frost-heaved blocks is lined up along a pair of parallel cross joints that strike at right angles to the longitudinal foliation in the host metasomatized volcanic bedrock. 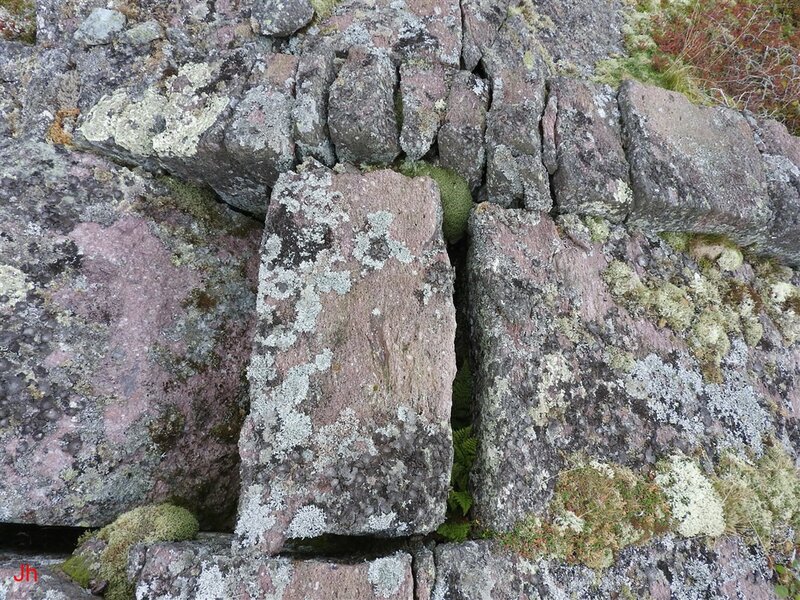 Similar rows of frost-heaved blocks following cross joints or longitudinal joints are seen at other locations in the local area. This type of occurrence is suggestive of pressurized water/ice emanating from joints (fissures) as being the cause of the observed frost heave. The above photo shows the restricted plucking component of IF05. The hammer seen on the tilted joint block near the center of the photo is 27 cm long. The restricted plucking activity has occurred on the down-ice sloping side of a small bedrock ridge. 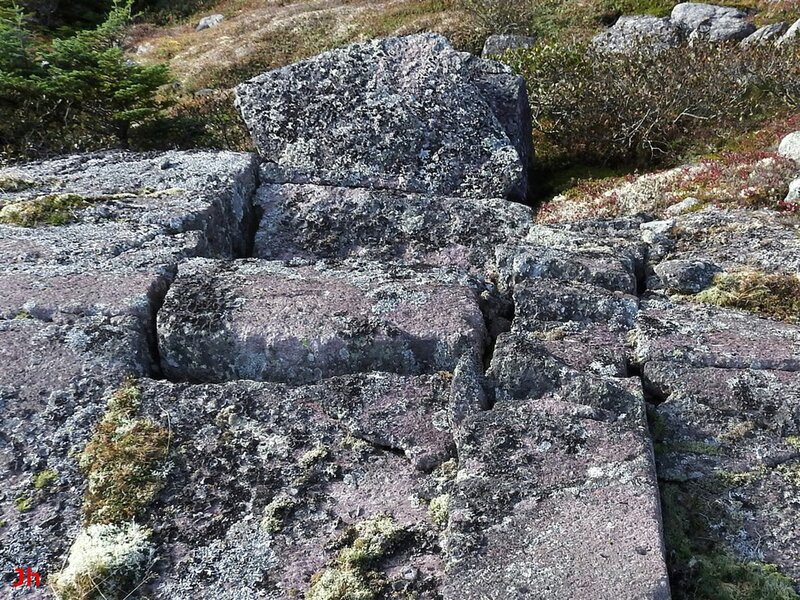 It is apparent from the photo that the right-most two large blocks have been completely dislodged from bedrock by ice. The left-most large block has been tipped forward by about 45 degrees. The illustrated occurrence is regarded as restricted plucking because, while the large blocks have been plucked from the ridge, all of the rock originally comprising the ridge is still present. In this regard, it should be noted that the ridge was presumably shaped by basal-slip glacial erosion prior to the plucking event and substantial rock was likely removed in that earlier phase of erosion. 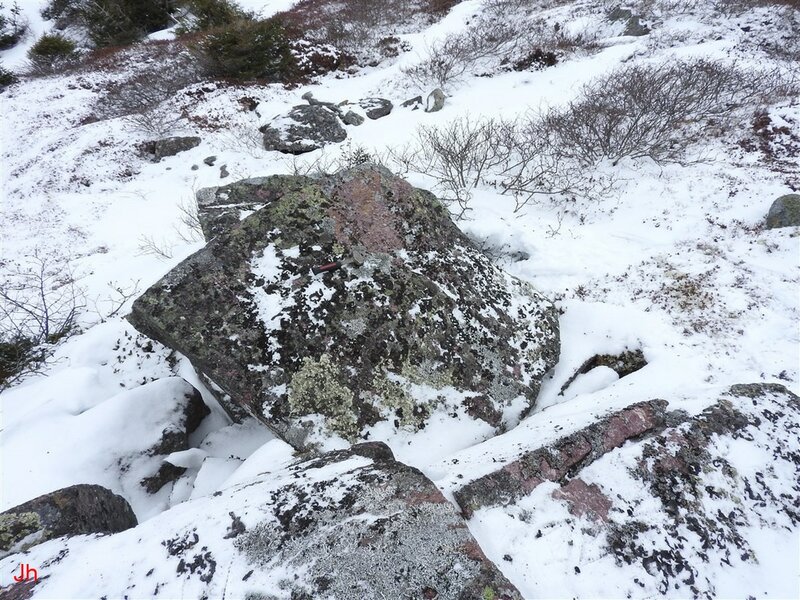 The observed bedrock disruption by frost heave and plucking was then precipitated following a transition to cold-based glaciation. The following photos show the restricted plucking feature viewed from different angles. The fourth (bottom,right) photo above shows clearly that the upper dislodged block conforms with the lower block when the upper block is rotated clockwise (looking down) about a vertical axis and then translated toward the camera. 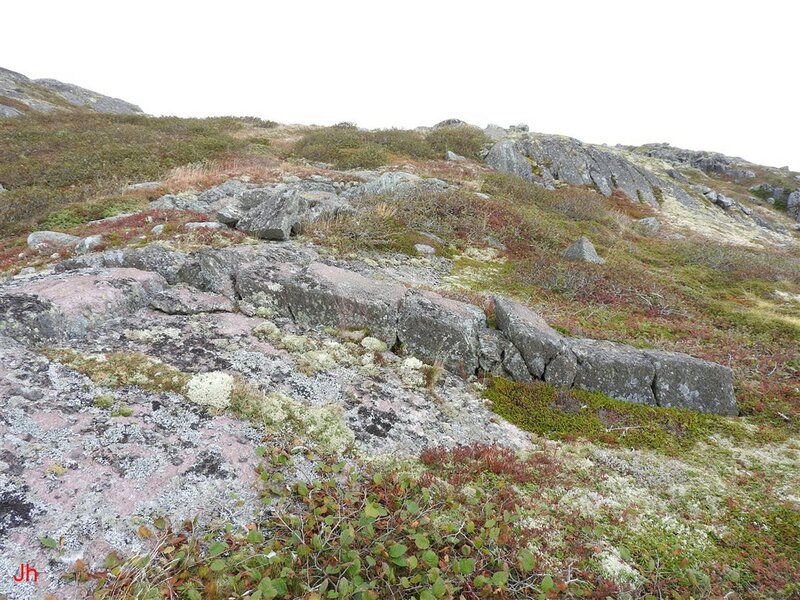 The second (top, right) photo shows an adjacent large block in the foreground that has also been tilted outward away from the ridge. The discussion under the heading "Analysis of the plucked area" in IF03 includes a diagram illustrating how pressurized groundwater/ice moving in a cross joint can branch out into intersecting longitudinal joints, causing hydraulic frost wedging. This diagram also applies in describing the rock displacements seen above. 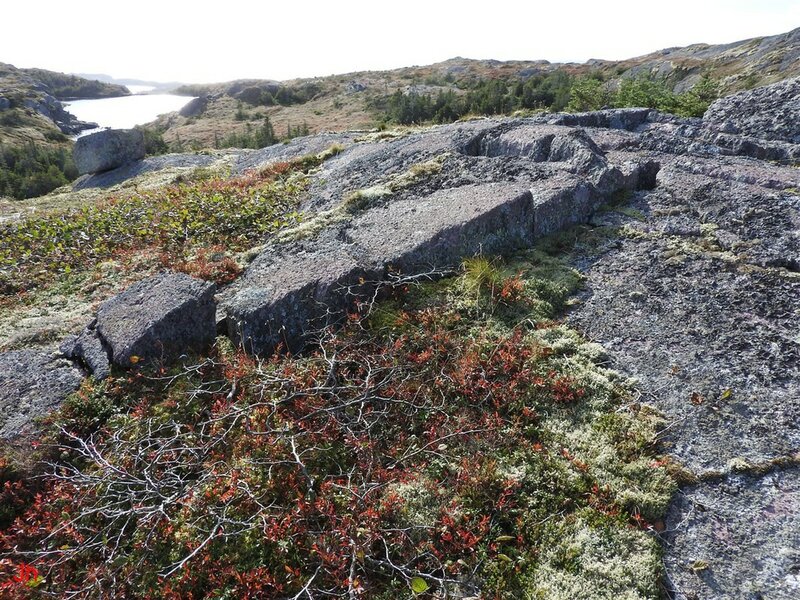 In making the argument (essential to the present analysis) that the above-illustrated rock displacements occurred in a subglacial environment it is necessary to argue that subaerial frost wedging was a less likely cause. The simplest demonstration of the probable presence of overlying glacial ice is seen in the layout of the shifted blocks. 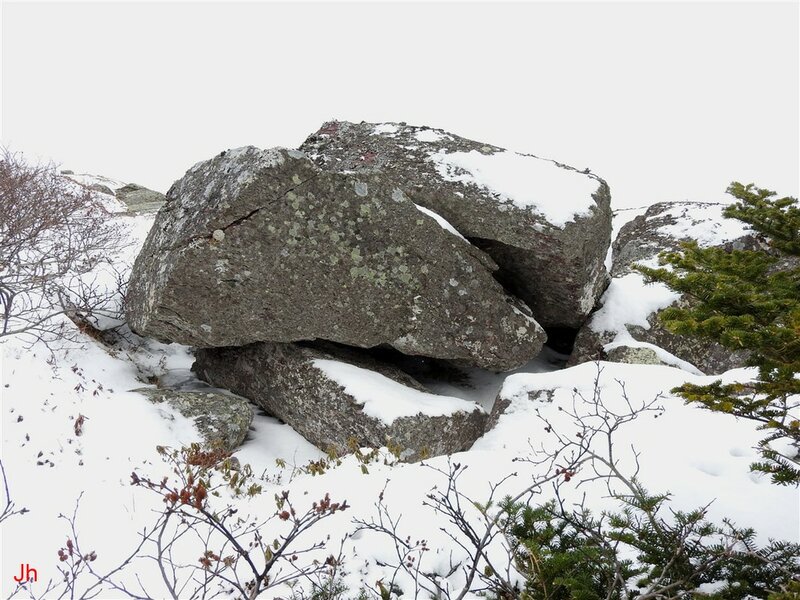 There is no obvious way for frost wedging to shift rocks into the observed configuration given that there is a complete lack of confinement. This argument strongly suggests the presence of glacial ice overlying the two blocks that were fully dislodged from bedrock. However, the overlying ice might have been remnant at the final stage of deglaciation, hence thin and static. Frost heave driven by seasonally-induced temperature gradients could theoretically have occurred under such "thin-glacial" conditions. 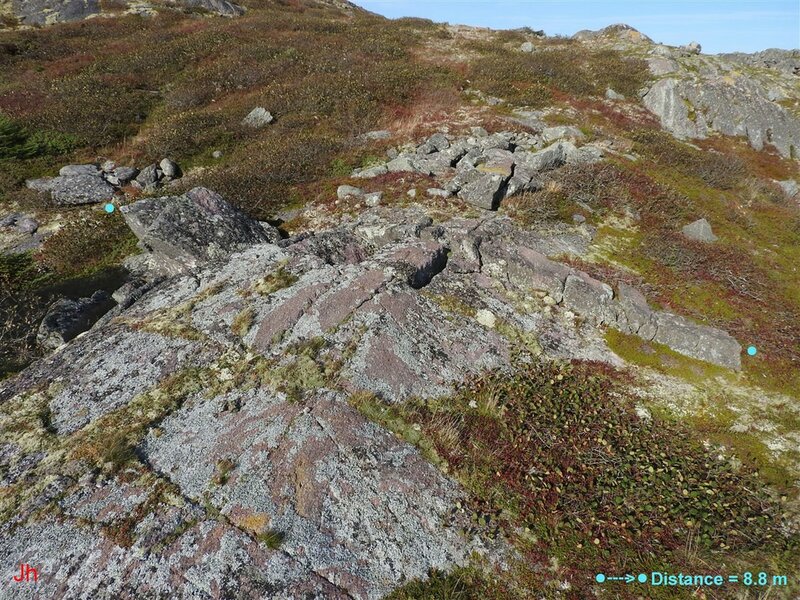 The photos below show how the shifted alignment of the upper dislodged block suggests movement of overlying glacial ice in the southwesterly direction characteristic of the area. 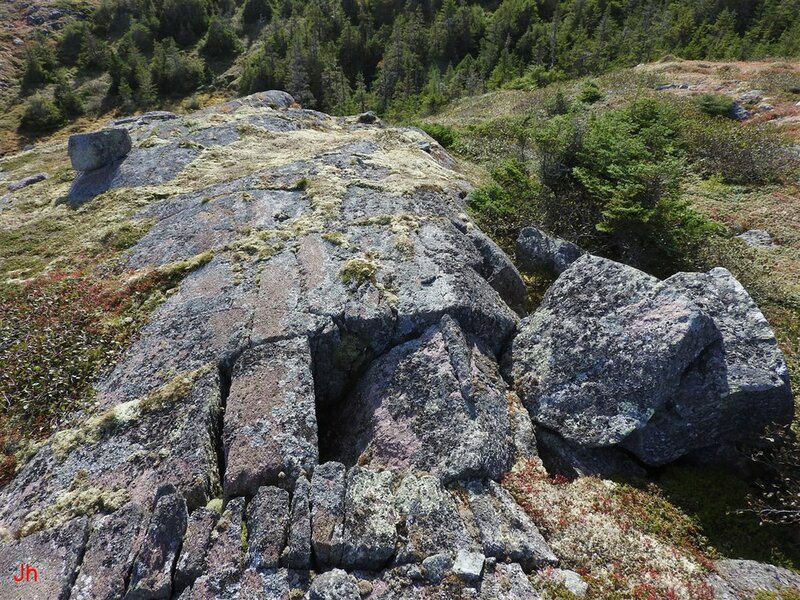 The photos above show a significant deviation in the angle of the relatively unconstrained top dislodged block versus the alignment of the lower block and the edges of the bedrock cavity. The realignment of the top block is toward the southwest and closely resembles realignments of blocks seen at the locations of IF03 and IF04. Both of these other locations are in the same general area as IF05. Each of the instances illustrated above show dislodged blocks aligned at similar angles relative to longitudinal cleavage. The cleavage strikes at about 20 degrees true at each location and the photos all look in an approximate westerly direction. These observations, if not simply coincidental, imply that regional ice motion influenced the alignment of the upper dislodged joint block in IF05. If the realignment of the top dislodged joint block in IF05 is assumed to have been caused by ice creep in an overlying cold-based glacier, then the ice thickness at this site must have been sufficient to override local hills and valleys, hence more than 100 meters. The block lying beneath the top block (these two blocks represent a single block split into two pieces, see above) was not realigned by glacial ice motion. This conforms with a creep-induced model for the rock realignment since the lower block was anchored in ice near ground level where ice creep velocity would be near zero. 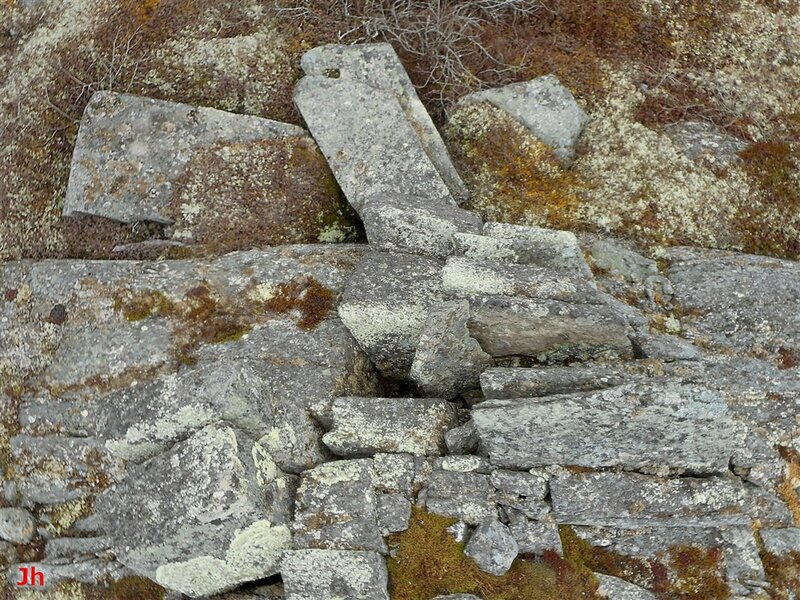 The above photo shows the transitional section of IF05 where frost-heaved bedrock gives way to restricted plucking. 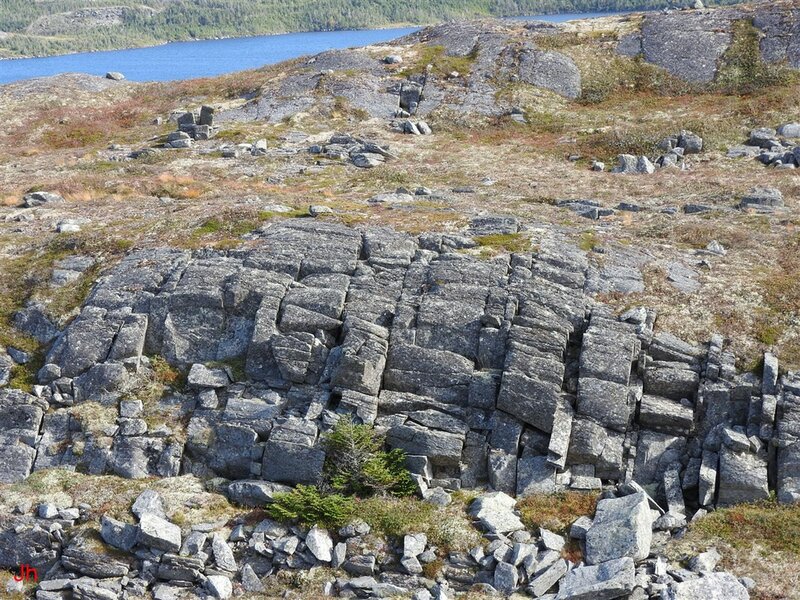 Some of the joint blocks in this central region might have originally been lifted by frost heave, but then settled back to their original positions after glaciation ended. The blocks in the central area fit loosely because ice pressure pushed blocks in the direction of the lower-right frame of the photo, creating more room at the center. The picture seen above again shows the center transition zone, and clearly illustrates how frost wedging has widened the gaps between the central blocks. 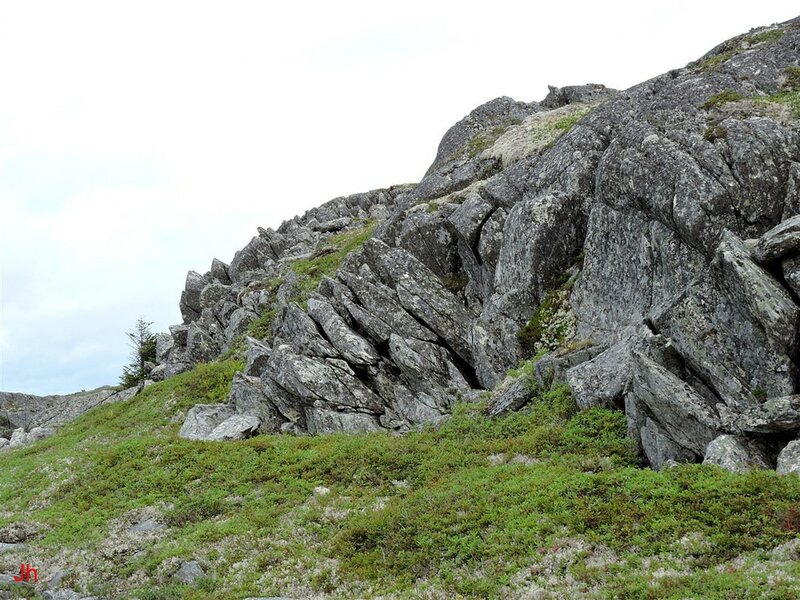 The failure of the rock on the down-ice side of the ridge and the subsequent displacement of the fractured rock apparently relieved pressure at the top of the ridge allowing joints to expand into ice-filled fissures. 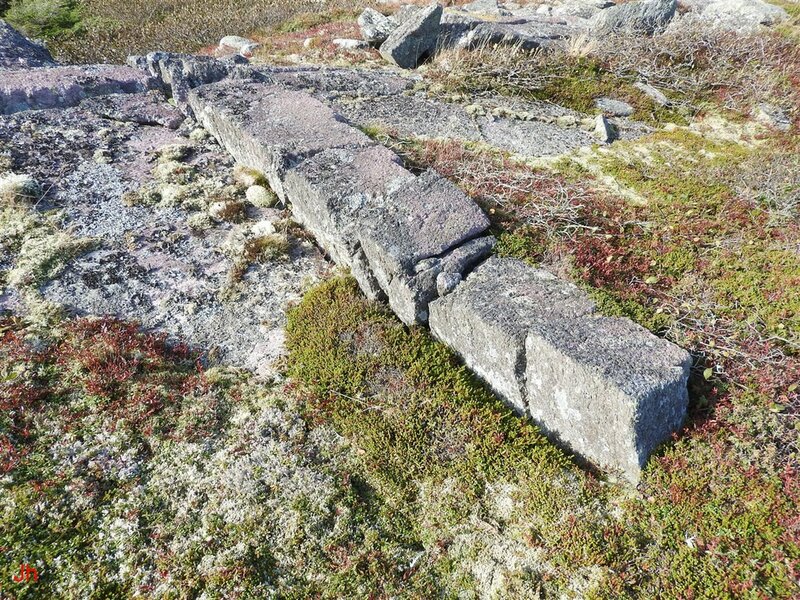 Major cross joints (fissures) seen on either side of the row of blocks were likely conduits for pressurized water/ice entering the system. 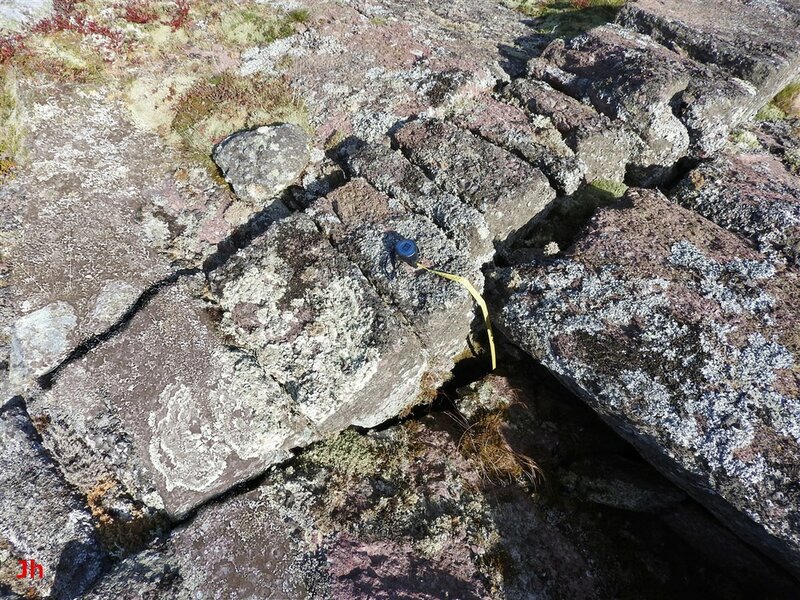 The first (left) photo above shows a measuring tape extending down into a fissure running along the south side of the row of frost-heaved blocks. 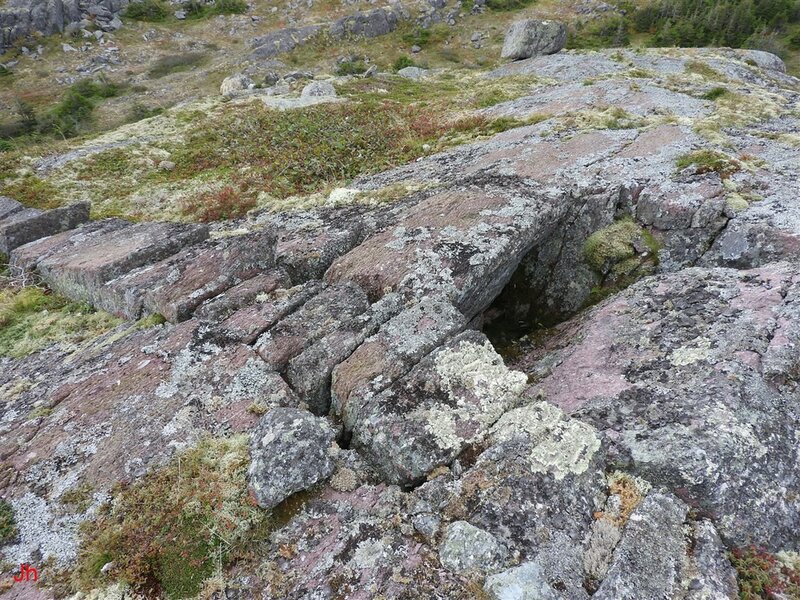 The depth of the fissure at the point of measurement was 1.2 meters, although the measurement was hindered by broken rock and vegetation in the slot. The second (right) photo above shows a large frost-wedged block lying at the start of the sequence of ice-displaced blocks comprising the restricted plucking feature. In summary, it appears unlikely that the components of IF05 were formed independently since they are closely connected and linked by a common conduit (frost-widened cross joints) capable of supplying water or ice under pressure to both the bedrock frost heave occurrence and the restricted plucking occurrence. Furthermore, evidence points toward the assumption that the restricted plucking occurrence is of deep subglacial origin. These two conclusions combine to imply that the bedrock frost heave at this site occurred subglacially. As mentioned above, restricted plucking is an abundant and large scale phenomenon on the Isthmus of Avalon that is closely geographically associated with bedrock frost heave. Both processes, subglacial bedrock frost heave and restricted plucking are dependent on water or ice propagating in bedrock and erupting beneath cold-based glaciers at pressures greater than the basal pressure of the overlying glacial ice. The assumption of validity of this model necessitates a close look at the means by which water or ice can move through frozen bedrock. Some of the restricted plucking occurrences observed on the Avalon are large enough to imply the slow release of thousands of cubic meters of ice from sloping rock faces.